Across the world, electric buses are providing a smooth and quiet passenger experience with zero emissions at the tailpipe. As Europe, California and China take the lead in placing increasingly strict regulations and restrictions on internal combustion engines, transit agencies and operators are looking at electric buses as the best option to transition their fleets to zero emissions, without affecting service levels. There are several different electric bus technologies. The principal difference is in how the electricity is delivered to the motor: through overhead wires, through 100% battery power, or through a hybrid battery-fuel cell power train—called a fuel cell bus, a “hydrogen” bus, or the ‘Other Electric Bus’. The “non-rechargeable” option is overhead wires (catenary wires), traditionally called trolley buses. The costs of implementing a new catenary system today is enormous, both in the physical installation of an entire bus system and in the route restrictions of buses that are tethered to wires. For these reasons, most attention is on “untethered” electric buses with batteries. Among batteries, the choices are 100% battery buses and fuel cell electric buses. Today, the most popular electric bus option is the 100% battery bus with the batteries being recharged using either roadside fast chargers or depot overnight chargers. However, challenges have arisen as these systems are implemented at larger scales. The challenges occur in range, route flexibility, and in electric infrastructure complexity. These challenges have again been highlighted at recent conferences in Oslo and Amsterdam. 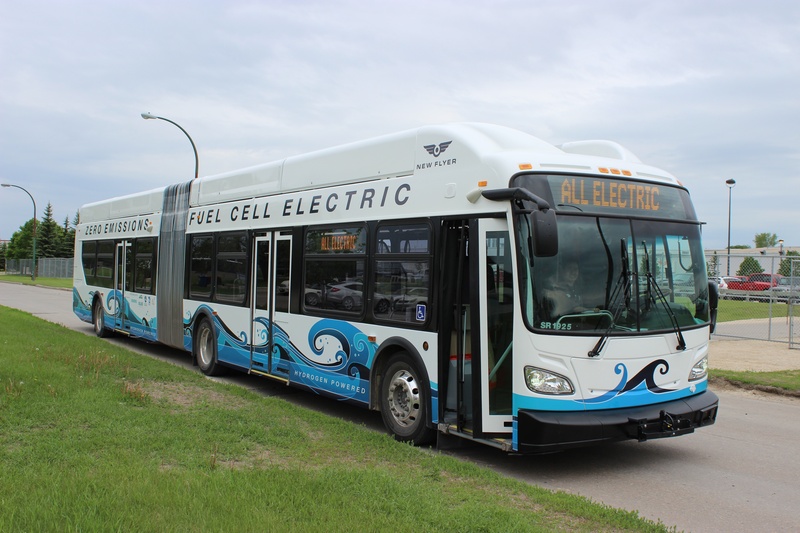 The fuel cell electric bus (the Other Electric Bus) address these challenges while retaining the electric bus advantages of a comfortable, smooth, near-silent, zero-emissions ride. How do onboard fuel cell chargers work? The fuel cell electric bus—the Other Electric Bus—is a 100% electric bus with a hybrid battery-fuel cell power train. The fuel cell system acts as an onboard battery charger, using hydrogen as a high-density energy source. The fuel cell provides electricity to the electric drive, and maintains the bus battery at an optimum charging level. Hydrogen is the Other Electric Bus’s energy source. Hydrogen stores twice the energy of a standard bus battery at a fraction of the weight. As a means of storing and transporting low-carbon fuel, hydrogen is an effective alternative to the electric grid. When produced from renewable energy, hydrogen is a true zero-emission fuel that also enables grid-balancing and large-scale, long-term energy storage. Hydrogen will play an important role in the decarbonization of our economy. Refueling is fast: less than 10 minutes of refueling delivers 18 hours of continuous service. Building an infrastructure for 100% battery systems often incurs additional, unpredictable costs for upgrading power grids and facilities. Electricity is often purchased in a regulated market: the more you buy the more expensive it may become. The trend is irreversible. Around the world, transit systems are “going electric”. Electric buses are the proven option for true zero emissions at tailpipe. The choice that faces cities and transit authorities is how to recharge their electric buses. Should they install a roadside-opportunity charging infrastructure, a system of overnight depot chargers, or should they install a centralized hydrogen refueling facility? Ultimately, cities will make their choices based on their unique operational requirements, geography and climate, as well as the availability and price of electricity and hydrogen, and local constraints. Many cities will choose a combination of 100% battery buses and hydrogen fuel cell buses. It is essential for transit agencies and bus operators to include all zero emission options for zero emission bus tenders. The best choice is not to name any specific technology, and leave it to the bidders to propose the best technology and charging infrastructure—or combination of technologies—that present the optimum solution for a particular route and/or city. The proposed comparisons should include all costs: vehicle and the complete charging/refueling infrastructure, including any required civil engineering and grid upgrades. The results may surprise you: today, in some regions, fuel cell electric buses, with fixed-price hydrogen contracts (all-inclusive of H2 station equipment and operations) are already competitive with 100% electric bus solutions. At FCB OSLO18 conference, industry stakeholders presented solution to deliver zero emission fuel cell electric buses and hydrogen infrastructure to cities and bus operators in Norway. The pathway has been prepared; now is the time to implement zero-emission fuel cell buses in our cities.